looking at routes a south to north route is just far too long and far, it will take months to do it, so I was thinging of going from Lima to Rio de Janeiro then by hook or by crook making my way down to Patagonia. Howzit! So glad I found this thread, also planning a trip from Argentina to Alaska in 2014- huge mission. I have been to South America before, but not on bike. Planning a South to North journey after shipping my bike to BA- I think the admin with buying a motorcycle and registering it in a foreign country, in foreign currency and in a foreign language is just too much for my brain. I have done a fair amount of research on the trip, and learning more every day. So... Fuzzy Muzzy- if you're interested we can keep in touch, share ideas and maybe ride together for part of the trip, will also be in touch with all the guys on the thread with experience- thread FOLLOWED! Yeah! for sure, riding South America is a dream i will not give up easily on. Do you have any ideas of route etc. My biggest question is weather or not to ship a bike there or to buy one there. Ja, Ive planned a loose route from BA down south to the glaciers and then up the west coast to panama, still have to plan for central America, the route took a while to plan, but its pretty decent, with lots of riding through national parks and wilderness. Its similar to what most of the guys have been doing that Ive talked to. I reckon you just need to know what places you want to go through and what highlights you want to see, in-between is adventure. We plan on camping the majority of the way, which lands up very cheap in remote areas. About the bike issue- I'm going to ship mine across, with all the extra equipment and mods. Having to go through all of the bureaucracy and stuff with foreign currency in a foreign language just seems like too much of a headache. There's two of us going, so that halves the price of shipping at least, when we have a date I'm just going to post it on the forum on the off chance that someone wants to share a container. I will add that you should stay away form the Pan American (in Peru/Chile)/Ruta 40 in Argentina, because frankly its boring tar. 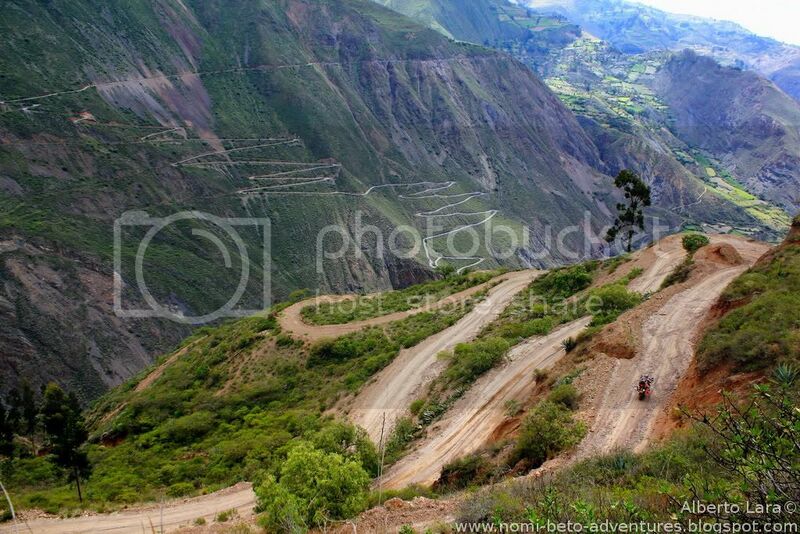 You want to take the roads in the mountains, following the Andes for a real adventure. There is plenty of this stuff all over Peru. Remember rainy season is Oct-Feb, so be prepared to ride wet in temperatures down to -15. The rest of the time should be hot though, becausey you change altitude so often. Also if youre coming in the rainy season fine, but get an early start to the day as most afternoons are much wetter. If you want some cool routes from Northern Argentina, Bolivia, Peru, Brazil and Ecuador, ping me on this thread or PM. Halfadog.. how long were you thinking of going for and more or less the time of the year? If I had to go and I had to ship a bike I would have to do it on my Transalp, I think it would be a great bike for the trip. @Bluebull2007- Thanks man! I am going to take you up on that offer! woah.. that is a long time. I was thinking more like 3 months max. At a year you will not even need to plan, just go with the flow. It is a long time- but that's for North and South America. It does allow you to go with the flow a bit- exactly what I'm looking for- if we like it: we stay for a while, if we don't: we move on, someone suggests somewhere else along the way: check it out. Thta is the best way. When we rode to Dar my mate went to Dar and back in 26 days, we did it in 59 days . Sometimes snails pace is the best pace. So! After a long time planning this is finally coming together, we have arranged the big trip (called "The Great American Trek") So its definitely going to happen, and even better: its happening for charity, even got some great sponsors and media on board already. Ive posted a few more details in http://www.wilddog.za.net/forum/index.php?board=12.0 - we would love to hear any comments, suggestions or help - About time we got the Wild Dogs involved! If you make it all the way to Alaska you will come through the state of Washington, be sure to let me know and maybe I can ride a ways with you. Have a place for you to stay and a shop to work on your ride. Well if you're still interested in riding and budget permits, it would be great to share the road! I met this guy in Uyuni, Bolivia. If you can get hold of him then I´m sure he will have more than a couple of tips to hand out. Its only funny until somebody gets hurt, then its freaking hilarious.